Looking for somewhere to get away from it all for a couple of days? Somewhere that doesn’t require a passport and promises a restorative and memorable experience? Australia is home to more than 500 national parks over 28 million hectares of land, spanning mountain, desert and rainforest terrain. Many remain ‘best-kept secrets’ yet offer the chance to interact with flora and fauna in a range of diverse and affordable holiday options far and away from the hustle and bustle of city life. For the most part, Australia’s national parks are managed by the states and territories, however, the federal government does look after six national parks and 13 marine parks. The aim of a national park is to offer enjoyment to both Australian and foreign visitors while looking after and protecting special habitats, ecosystems, natural wonders, Aboriginal sacred sites and shipwrecks, by monitoring human activity and prohibiting farming. On 26 April 1879, Australia proclaimed its first national park south of Sydney, NSW, which in its early years was ostensibly a place for Sydneysiders to retreat to for relaxation rather than conservation of the environment. After Yellowstone National Park in the United States, Australia’s Royal National Park, as it is known, was the second of such parks in the world. The Royal National Park is diverse and as popular a place for its bushwalks, birdlife, picnics and barbecues as it is for whale watching. Highlights include Bonnie Vale campground right on the beach offering tent, trailer and caravan sites. Be sure to book early to avoid disappointment. For walkers, there are a number of picturesque choices that include Bundeena Drive to Marley walk, Forest path and Karloo walking track along with plenty of picnic sites, as well as guided walks and tours. Flinders Ranges National Park is located about 450km north of Adelaide in South Australia, which is around a five- to six-hour drive. 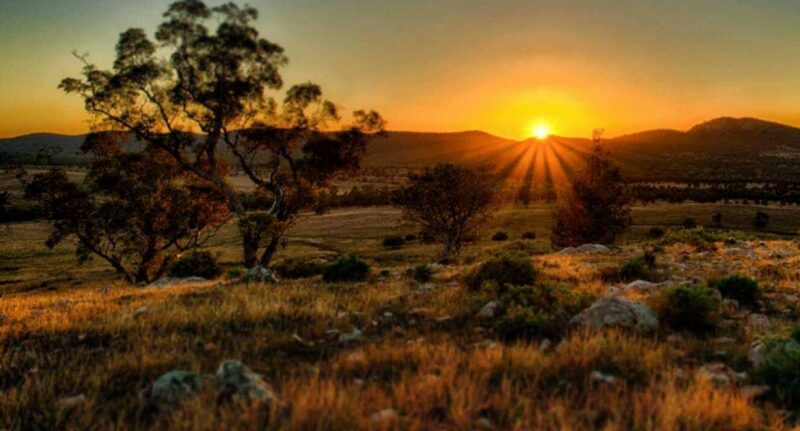 Situated between the towns of Hawker and Blinman in the Flinders Ranges, this national park is known for its natural, cultural and geological significance, and is home to the famous Wilpena Pound (Ikara). This 80-square-metre natural amphitheatre is cradled between the park’s towering mountains. This 80-square-metre natural amphitheatre is cradled between the park’s towering mountains. It resembles a huge volcanic crater, which was formed from the erosion of a mountain range. There are many bushwalking trails and scenic drives, guided tours and scenic flights with a choice of accommodation from camping to four-star hotels. Recognised as a UNESCO Biosphere Reserve, Kosciuszko National Park (five-and-a-half hours from Sydney or two-and-a-half hours from Canberra) is the largest of all the national parks in NSW and comprises Australia’s highest mountain, Mount Kosciuszko, the Snowy River and ski fields. The historic cattlemen huts and dramatic mountainous terrain provided all the romance and inspiration for poet Banjo Paterson’s famous poem, ‘The Man from Snowy River’ that was first published in 1890 in ‘The Bulletin’ and later became a box-office hit when it was released as a movie in 1982. The historic cattlemen huts and dramatic mountainous terrain provided all the romance and inspiration for poet Banjo Paterson. Kosciuszko National Park offers an abundance of natural splendours from alpine flora to caves and gorges, with native fauna including endangered species of corroboree frog and mountain pygmy possum. While it is open to visitors all year round, some roads and trails close because of weather conditions. In the winter months, Kosciuszko National Park is a go-to for extreme adventurists who enjoy skiing and snowboarding, while summer is a prime time to camp, bushwalk, fish and mountain bike. Cascade Hut trail is nature’s playground when it comes to outdoor pursuits like cross-country skiing in winter and hiking, camping, mountain biking and picnicking in summer. There are many great and interesting places to stay, with some beautiful and award-winning accommodation that includes Creel Lodge, Currango Homestead, Daffodil Cottage and Yarrangobilly Caves House 1917 section. Purnululu National Park may not be as accessible as other national parks, but it is possible to experience in a weekend with a little forward planning. Situated around 300km south of Kununurra, Purnululu is a bushwalker’s paradise and is open only during the dry season (April to November), weather permitting. The Bungle Bungle Range is a highlight, with astounding beehive-shaped rock formations — known as a photographer’s dream destination. US photographer and Instagrammer Colby Brown is quoted saying it is one of his most favourite regions in Australia. While only discovered by European civilisation in 1983, the area has been used by the Aboriginal people for thousands of years and as such, has a rich cultural heritage complete with many ancient Aboriginal artworks and burial sites. While the park is run by the West Australian government, the Aboriginal Traditional Owners also contribute greatly to its management and relationship to Aboriginal heritage. The area has been used by the Aboriginal people for thousands of years and as such, has a rich cultural heritage. A remote wilderness experience is promised to visitors who are willing to take a few days to discover the Bungle Bungles by foot. The alternative is to take a scenic heli-flight from Bellburn Airstrip which reveals a hidden world of dramatic gorges and freshwater pools. Helicopter air tours are available from Bellburn Airstrip. There are many and varied walks to choose from and most visitors camp for several days. Based at one of the two camping grounds (Kurrajong and Walardi) walks include the Piccaninny Creek Walk (which requires an overnight camping trip), Mini Palms Gorge, Cathedral Gorge and Echidna Chasm Walk. A range of 4WD tours leave from both Halls Creek and Kununurra or you can hire a 4WD and journey into the park on a self-drive adventure. Visitors must bring their own food and water as there are no shops nearby. The Glass House Mountains National Park is just an hour’s drive from Brisbane and perfect for that quick, worry-free, weekend away. Named by Lieutenant James Cook during his voyage of discovery along Australia’s east coast, the Glass House Mountains are another great example of amazing landscapes and geological formations resembling craggy volcanic peaks that tower dramatically above the surrounding landscape. Also an area of Aboriginal significance, the area was a meeting place for trading and ceremonies with protected burial sites still present today. There are many walking tracks that lead through the pine plantation and open forests to offer stunning views as well as the opportunity to abseil and rock climb for the more adventurous. The Glass House Mountains are another great example of … geological formations resembling craggy volcanic peaks that tower dramatically above the surrounding landscape. While there is no camping ground within Glass House Mountains National Park, nearby Berrburrum State Forest offers camping at Coochin Creek, as well as a range of holiday accommodation that is available in the Sunshine Coast hinterland. A number of private camping areas are also situated on Glass House Mountains road. The beauty of the Sunshine Coast is its abundance of national parks all within close proximity. This is just a small window into the many natural attractions and experiences that our land offers. There is no shortage of things to do or see, and the opportunities are there for the taking.